Have you spotted a Magnificent Frigatebird? The Magnificent Frigatebird (Fregata magnificens) was sometimes previously known as Man O’War, reflecting its rakish lines, speed, and aerial piracy of other birds. With its huge size, long, pointed wings and forked tail the frigatebird is instantly recognizable even at long distances. It is most often seen soaring over coastal areas. 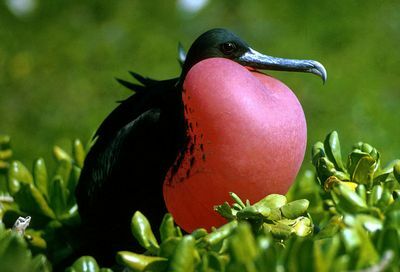 This Frigatebird is widespread in the tropical Atlantic, breeding colonially in trees in Florida, the Caribbean and Cape Verde Islands. It also breeds along the Pacific coast of the Americas from Mexico to Ecuador including the Galapagos Islands.